↑ ক খ গ "The Project Gutenberg EBook of Autobiography, by John Stuart Mill" gutenberg.org. Retrieved 11 June 2013. ↑ "John Stuart Mill's On Liberty"। victorianweb। সংগ্রহের তারিখ ২৩ জুলাই ২০০৯। On Liberty is a rational justification of the freedom of the individual in opposition to the claims of the state to impose unlimited control and is thus a defense of the rights of the individual against the state. ↑ Linda C. Raeder (২০০২)। "Spirit of the Age"। John Stuart Mill and the Religion of Humanity। University of Missouri Press। পৃষ্ঠা 65। আইএসবিএন 9780826263278। Comte welcomed the prospect of being attacked publicly for his irreligion, he said, as this would permit him to clarify the nonatheistic nature of his and Mill's "atheism". ↑ Capaldi, Nicholas. 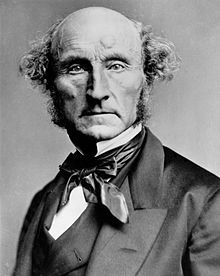 John Stuart Mill: A Biography. p.321-322, Cambridge, 2004, আইএসবিএন ০-৫২১-৬২০২৪-৪. Utilitarianism as Secondary Ethic An overview of utilitarianism with summary of its critiques. Principles of Political Economy with some of their Applications to Social Philosophy (Ashley ed.) . See original text in The Online Library of Liberty. The Subjection of Women (1878 ed.). See original text in The Online Library of Liberty.